BANKING ON EXPANSION. A recently announced fundraising campaign will help Feed My People Food Bank in Eau Claire more than double its space. In the 10 years since Feed My People Food Bank moved into its current home on Eau Claire’s north side, the need for its services has only grown. Last year, the food bank distributed 7.3 million pounds of food to more than 200 agencies in 14 west-central Wisconsin counties. A decade years early, Feed My People distributed just 2 million pounds of food a year from the same space, Executive Director Emily Moore said. 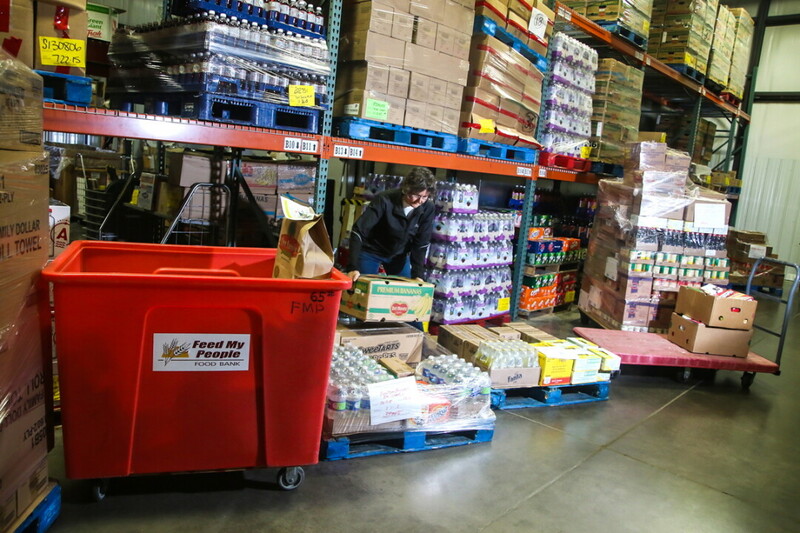 The critical need for more room, coupled with early pledges from generous donors, has led the nonprofit food bank to launched an expansion campaign, dubbed Feeding Healthy Futures, which aims to more than double the facility’s size by the end of the year. The public phase of the fundraising campaign kicked off recently with the presentation of a $125,000 pledge from Eau Claire-based Charter Bank to Feed My People. Combined with support from other early donors – including Ann Gunderson-Thornburg, B.A. Mason Trust, Mayo Clinic Health System, RCU Foundation, Rutledge Charities, and Feed My People’s board and staff members – the group has raised $2.4 million of the $3 million it needs to complete the expansion. Moore said Feed My People is now seeking pledges, which can be made over as long as a five-year period, to raise the final $600,000. Feed My People moved into its current home, 2610 Alpine Road, in late 2009. In the time since, the volume of food the nonprofit handles has skyrocketed, including a seven-fold increase in the amount of fresh food and produce the food bank deals with, Moore said. The project will expand the facility from 19,000 to 45,000 square feet. This will triple the amount of cooler space (critical for all that fresh produce), add five loading docks to the existing three, double the amount of spaces for pallets, increase the work area for volunteers, add a “clean room” to make repacking food easier, and building second-floor office and community space. Work is expected to begin this spring and to be finished in the fall. “It’s predominantly (adding) space,” Moore said of the project, “but that space will create opportunities.” Sometimes ideas simply can’t be implemented at the food bank because it is so cramped, she explained. In addition, the expansion will provide more room for training volunteers. Overall, however, the expansion will allow Feed My People to operate much more efficiently: Currently, large quantities of food – especially fresh food – must be moved around frequently as shipments go in and out. Improve the flow of food around the warehouse will make it more efficient and safer. Ultimately, however, the project isn’t about Feed My People as an organization. It’s about the 70,000 hungry people – more than 25,000 of them children – who the nonprofit helps feed. To learn more about Feed My People Food Bank and find out how to make a pledge, visit mpfoodbank.org. Feed My People is also planning an open house – complete with tours, food, and live music – from 4:30-6:30pm Thursday, April 11, at 2610 Alpine Road.